비밀번호를 잊으셨나요? 아직 회원이 아니신가요? 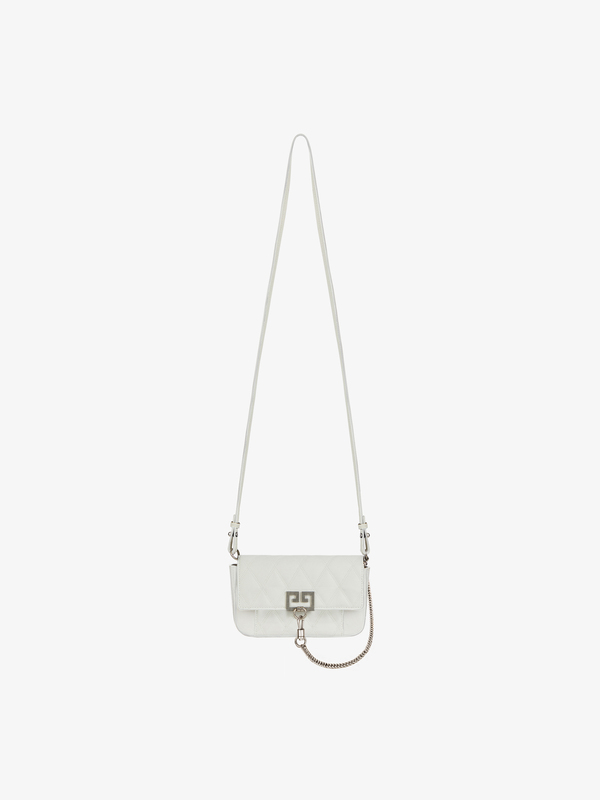 Mini Pocket bag in smooth white leather with flap and small flat pocket on the front in diamond-pattern quilted leather. Antique silver-finish Double G metal piece on the flap. Bag comes with a long, thin, removable shoulder strap in leather for wearing across the body, and a short chain strap for carrying by hand that can also be attached to the side of the bag using a snap-hook. One main compartment and one flat pocket inside. Two loops on the back of the bag, allowing it to be worn on the Double G 3 cm belt (sold separately). 새로운 컬렉션과 이벤트 소식을 가장 먼저 만나보세요. 개인정보 보호정책에 명시된 조건에 따라 지방시의 본인 개인정보 처리에 동의하며, 뉴스레터, 이벤트 초대, 마케팅 설문조사 참여를 포함한 지방시의 제품 및 서비스에 관한 개인 맞춤 정보 이메일 수신을 동의 합니다. 지역에 따라 통화가 변경되며 온라인 구매 가능 여부를 표시합니다. 온라인으로 구매한 제품은 일부 지역으로만 배송 가능합니다.